Vision Wall is a permanent installation of three generative artworks displayed in KAPSARC, an energy research center in Saudi Arabia. 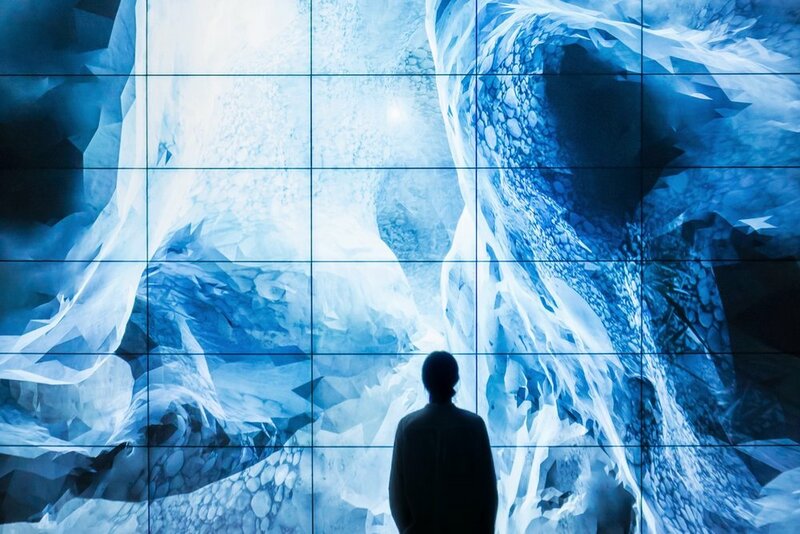 The vision wall is a high-precision, low-level multi-screen wall that syncs 20 computers together to exhibit one generative work of art. The wall itself covers a section of a wall within KAPSARC from floor to ceiling creating a statement piece for all to view. In an abstract way, each work of art portrays the connection between persistence and exploring. Through the works, the Vision Wall touches on the themes of collaboration, nature, and exploration. In Vision Wall, there are 3 sub-works of art focusing on each theme. The first is A Thousand Minds, focusing on the aspect of collaboration. The generative work of art is an infinite sequence of highly complex network visualizations. 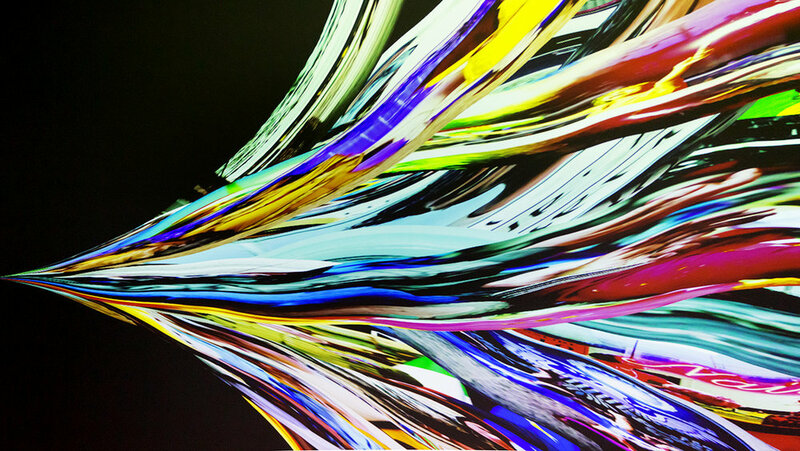 The visuals displayed look almost like small ribbons of different colors flowing constantly in different fluid ways on the vision wall. The visuals portrayed are bringing to life the neural activity of open-source brain scan data that shows the complexity of human interaction. The collaboration aspect is shown through the integration of networks within the brain and having it translated into generative art. The vision wall shows the collaboration between the two and the artistic output you can achieve between the two. It alludes to the idea of continuous exploring because the generative work of art does not stop showing the constant movement and activity within a brain creating the metaphor that we will not stop exploring and the nature of our brains is to continuously search and find answers. The next generative work of art in Vision Wall is Solar Sailor. Solar Sailor plays into the theme of nature by having the having the work observe an infinite succession of sunrises and sunsets. This is done through a physical real-time simulation of the light fraction in the Earth's atmosphere. The unique aspect of this work of art is that the sunsets and sunrises are created in the perspective of a satellite orbiting the earth creating grandeur visuals that most people will never get to experience through this rare perspective. The aerial view displays a variety of vibrant colors emulating off each sunrise and sunset while also displaying the cloud formation (from each place) as if you were looking at it from above creating an abstract visual from the real product of nature. Nature plays the main theme in this work of art the exploration and collaboration concepts are still evident. The never-ending sunrises and sunsets are continuous and will never be the same as each sunrise and sunset will vary in every environment of earth based on events. It creates the need for exploration because news things are being seen every day reminding us that as humans we will never know all the answers which strive us to continue learning. The last generative work of art is Unknown Territories. The piece for exploration is an infinite journey through generative caves. The caves come from all terrains some being ice caves, desert caves, underwater caves and more. The symbolism is the idea of infinitely traveling and diving deeper into unknown territories push each image and each viewer further in the unknown and possibilities. This is a characteristic needed that defines exploration; it is the idea to keep pushing further and further into the unknown for curiosity and for answers. Each cave pulls in the concepts behind exploration while still leading with the example of nature and how it is natural that the unknown is out there- creating a drive for discovery. The Vision Wall is a powerful work of art as it provides a beautiful and almost poetic way of describing the need and drives to discover more about the world around us. The mesmerizing scenes capture the audience's attention but provide a variety allow people to connect to one generative art or to provide a larger understand with the three generative artworks together. The Vision Wall was commissioned by an energy research facility. The work produced by field.io works flawlessly within the building itself but also captures the meaning and purpose of employees work at the research facility. The placement of the work is just as important as the piece itself. It allows for both elements to feed off each other and create a strong message together about the importance and energy research and our goals of exploring nature. Linear Perspective by Casey Reas is a generative work of art that takes all the cover pages from The New York Times in the year of 2015 and creates a deconstructive video out of them. The images are placed on the left end of the screen and soon begin to be stretched across the screen in a distorted manner. Each image is layered on top of each other creating multiple layers of distorted images combine together to create a culminating experience with the video as all the images mix together to create one cohesive work of art. Linear Perspective calls attention to the forced perspective of information given to the public based on the fact that The New York Time deems what is acceptable as to be on the front cover. The manipulation of the covers in the work of art alludes to both the manipulation of the public and bringing realization to the public about the manipulation behind The New York Times and other news sources. The connection between Linear Perspective and Vision Wall is not only the use of generative art but also the purpose behind it. Linear Perspective most connects to the generative art focusing on collaboration. The images themselves have strong similarities as both displays a multitude of colors in different layers as they move in a fluid motion across a screen. Despite each generative work of art coming from different inspiration and end goal, they both manage to display similar works of art. Works of art may vary or look similar in the end product but was is important is the meaning and interpretation behind them can be very different and each can affect every viewer in a different way or provide a new perspective in the topic that was used as inspiration for each artwork. System Aesthetics is digital illustrations produced by Field.io that study the form of structure and behavior in several artificial intelligence algorithms that people use in there every day lives. The purpose behind the several works of art created in System Aesthetics is to help place complicated algorithms into a visual creation for people to understand the complexity of the input and output information these systems use to perform their ask. The digital illustrations provide awareness of how the AI systems work and to show the capability of information they hold and understand. Each illustration is a metaphor for the inner workings of each algorithm that translates to the public understanding. What drove the inspiration for this work of art by Field.io resembles the characteristics of the Vision Wall and that is exploration. By creating digital illustrations it contributes to the characteristics of exploration and understanding the knowledge of artificial intelligence as it has rapidly consumed our society today. The art shown helps viewers have an understanding of the complexities of the machines much like A Thousand Thoughts that put brain activity into a visual work of art for viewers to understand the complexities of our brain. System Aesthetics also connects to Unknown Territories in the aspect of exploration and the uncertain. Artificial Intelligence is something that is becoming popular in the world today. It is a system that allows it to teach itself every second of every day building upon its intelligence and forming new algorithms to perform more successfully. AI dives into the realm of uncertainty as we use it in the world today, much like Unknown Territories as it pushes viewers to continue exploring the unknown. Field.io has a creative and notable way of designing works of art that are innovative and provide clear visuals that express a deeper level of knowledge and or thinking. Their work provides a way to inspire people about knowledge while always pushing viewers to explore the unknown.